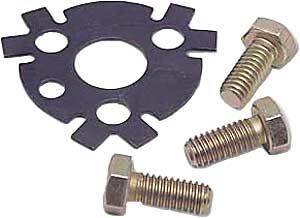 The COMP Cams Cam Lock Plate will help you make sure that the cam bolts cannot back out at any rpm level or load. Bendable locking tabs and special high-strength bolts make this kit a must for any camshaft installation. Does COMP Cams 4605 fit your vehicle? 4605 is rated 4.0 out of 5 by 1. Rated 4 out of 5 by romeo from easy to install alignment with bolts and ease of use make this worth every penny.